NEW YORK, New York, September 26, 2013 (ENS) – At the United Nations today, the war on wildlife crime was in the spotlight as heads of state and ministers detailed the impacts of poaching and illicit wildlife trafficking and called for a concerted international crackdown. The high level meeting, convened under the title Poaching and illicit wildlife trafficking – a multidimensional crime and a growing challenge to the international community, was hosted by the governments of Germany and Gabon. It was attended by ministers and other high level representatives from Belgium, Chad, Colombia, Norway, Thailand, the United Kingdom, and the United States. Jan Eliasson, deputy secretary-general of the United Nations, told participants, “Key species are being driven to extinction. The proceeds of illegal trade support transnational organized crime and terror organizations. Murder and violence go hand in hand with this despicable business. The illegal trade in wildlife and endangered species is linked to drug smugglers, gun runners and human trafficking. It is a threat to all three pillars of our Organization: human rights, peace and security, and development. “Fragile and conflict-affected states are particularly vulnerable because they lack the means to adequately regulate the exploitation of natural resources and control borders. For example, the Lord’s Resistance Army is known to be engaged in the illegal ivory trade in the Democratic Republic of Congo and the Central African Republic. 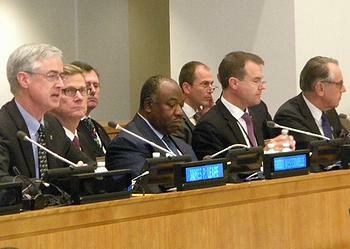 The illicit gain it generates is sustaining conflict,” said Eliasson. Illegal wildlife trade generates an estimated US$19 billion per year. Eliasson said UNTV, the UN Environment Programme and UN Goodwill Ambassadors are reaching out to audiences who may not otherwise hear this message. President Ali Bongo of Gabon called for the appointment of a UN special envoy on wildlife crime as well as a UN General Assembly resolution. His proposal was supported by UK Secretary of State for Foreign and Commonwealth Affairs, William Hague, and the German Foreign Minister Guido Westerwelle, as well as other representatives present such as Norwegian Environment Minister Bard Vegar Solhjell. During his speech on the floor of the General Assembly on Tuesday, President Bongo stressed the need for predictable funding for development from public and private sources, the importance of combating climate change and the threat to wildlife and biodiversity. Media reports this week linked the deadly Al-Shabaab attack on a mall in Nairobi, Kenya to poaching and illegal trade of ivory. 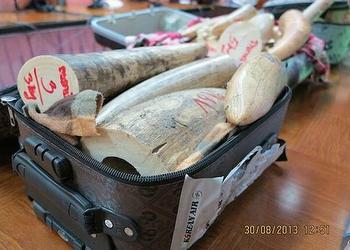 It is alleged that up to 40 percent of Al-Shabaab’s funds come from ivory buyers and consumers. Tanzanian President Jakaya Kikwete highlighted the problem of demand for ivory and called for help from the international community to close markets. “This is a step forward in the fight against wildlife crime, and today countries have shown they are serious in the fight against this organized crime,” said Director Generalternational Jim Leape. On Tuesday in Brussels, the U.S. government called on the international community to destroy all stocks of illegal and confiscated elephant ivory. The United States will be destroying its own ivory stockpile on October 8, as a symbol that ivory trinkets have no value and are leading to the unprecedented slaughter of elephants. The 5.4 ton U.S. stockpile consists of raw and carved elephant tusks, smaller carvings and other elephant ivory items. It will be crushed outside Denver, Colorado. “An elephant loses its life to poaching, on average, every 15 minutes,” said Jeff Flocken, director of the North American chapter of the nonprofit International Fund for Animal Welfare.